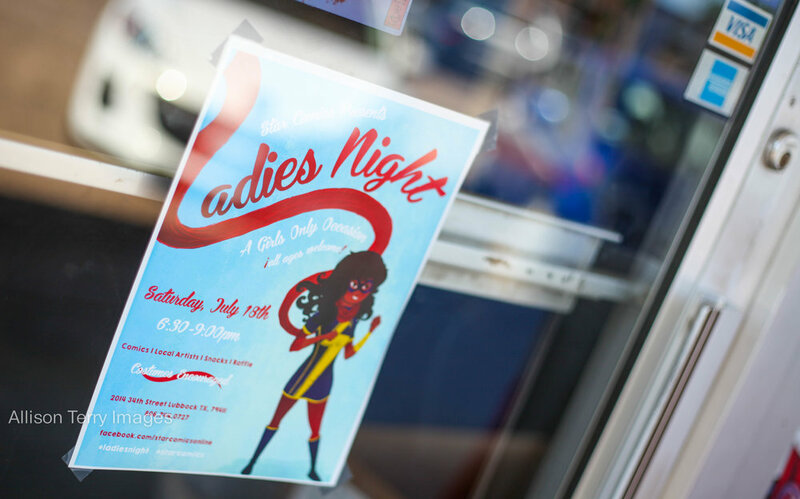 This past Saturday was once again Ladies Night at Star Comics. Planning this event wasn't nearly as stressful as the last one but that may have been because in between multiple road trips, having Geek Girl Brunch's prelaunch brunch, getting #workcomics ready for print, and getting the sketchbooks done, I was all out of stress. I think the most stressful part was getting the art for the flyer just right. I redid it 4 times in about just as many different styles. I'm glad it turned out so well. Also I didn't bake this time so that took a load off my shoulders. With this Ladies Night, we changed the format a bit. We raffled off the posters instead of giving them at the door (there was still a line waiting), snacks were put outside to make room in the store, chairs were put out there so people could sit and chat, at the kids table we set it up so they could make their own superhero masks, and we had two featured artists, Koolaid Girl and Kyanne Birley (she dressed up as Lumpy Space Princess!) Allison Terry Images was our event photographer for the night and did an awesome job, getting us some wonderful pictures. Even the local newspapers photographer came by and took some pictures of the event and its attendees. With Lubbock being a college town and Summer essentially being off season, we didn't have as many people as our first one, but it didn't really matter. We still had a pretty big turnout and the ladies stayed almost the entire time, more space making it easier to chat and browse. The artists had prints for sale and did sketch requests most of the night while people snacked and found something new to read. I saw a lot of ladies from the first event and got to talk to more than a few. It felt more relaxed and comfortable. More like what I had first imagined: a space where girls can just come and chat with other girls with similar interests and find something new to read. I think that's my primary goal with the Ladies Night. To give women and girls of all types, transgendered, and non-binary identified a place to go to relax and talk and not feel like they're outcasts. I want to give female artists and photographers and vendors a platform just like I'm trying to give the attendees. Comics are for everyone, not just boys. Nothing is "just for boys." And if a little girl can learn that later on, maybe that'll give her a little empowerment later on when things get tough. All in all, the night was a success. I'm happy and tired and forever glad to have been given the opportunity to do these events. Free stickers and buttons were grabbed, the posters were raffled, and there were plenty of cute little girls and awesome costumes through the night. Both our artists did tons of sketches and people walked away happy with some new art. Comics were read and suggested. It was a good night. Much thanks to Star Comics for supporting me and hosting the event. They are continuously rad and so so so so so awesome and definitely helped me to not stress out too much! Thank you to our incredibly talented artists, Koolaid Girl and Kyanne! People loved you and I am grateful to have you both! Go check out their websites to see some super cool art. Thank you to my former roller derby teammate and awesome friend/photographer Allison Terry! These images are gorgeous! If you are in Lubbock, you should definitely get her to do some pictures for you! And thank you to my boyfriend for being our security again. Sorry you couldn't come inside but I appreciate you! And now it's on to the next thing. Geek Girl Brunch Lubbock launches August 22nd and Hub City Comic Con is the weekend after that. Working on a lot of art and merchandise to get ready and we're getting the art prepped for #Workcomics to get printed. I'll put up more information about that soon! If you aren't aware, I revived my old Youtube channel where I do vlogs and talk comics and stuff so you can check that out.